It’s a photograph so tragic that would drive Dúlra to tears. 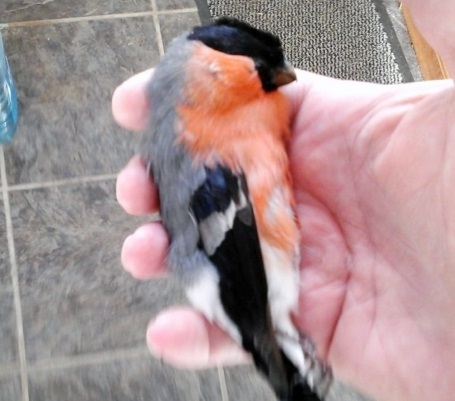 It’s of one of Ireland’s most beautiful birds, lying limp and lifeless in a human hand. The sparkle of life that a bullfinch carries with it with such aplomb is suddenly absent. This bird may have those same impressive feathers with their deeply contrasting colours, but the elegance with which they are displayed has vanished in the blink of an eye. This is Dúlra favourite bird – but it’s not in same way a school kid has a favourite number or colour. For the bullfinch evokes powerful emotions in Dúlra stretching back into his own childhood. The photograph was taken by reader Fergal Prenter and how the bullfinch met his end is a sorry tale of how just doing innocent, everyday things in our daily lives can have such catastrophic effects on nature. The bullfinch, corcrán coille in Irish – meaning pot belly of the woods – is generally hard to get up close to. It likes to skulk and issue its soft whistling sound from the thickest hawthorns – although with that startling plumage, you’d imagine it’s hard for the male not to get himself noticed. You’ve heard the expression ‘he could charm the birds from the trees’? Well, when the young Dúlra used to tramp the Belfast hills, one of his mates used to be able to mimic the whistle and the bullfinches would appear as if out of nowhere, land on a twig beside us, their heads tilting to one side inquisitively as if trying to calculate how a bullfinch could be six foot tall and wearing water boots. Schoolboy Dúlra caught a pair and bred them in his garden shed – it was clearly illegal and also cruel but there was barely a bird that wasn’t kept for some time in the 13-year-old Dúlra’s shed. They laid four beautiful eggs – Dúlra used to run home from school at lunchtime to check on them – but the chicks died after a few days, and he let the adults go free back to their home on Black Mountain. But spending a summer up close to a pair of bullfinches made a connection that has lasted the decades. The most wonderful thing wasn’t that spectacular plumage or the peculiar whistle, but the hyper-musical love song that the male almost whistles into the ear of his mate. Few people have heard it – you need to be be within a couple of feet to make it out. Schoolboy Dúlra used to stand at the shed out of sight with the door open and his ears would burst with the music that would rival Mozart. The average bullfinch lives just two years. The hazards of the countryside are numerous. And of course we have the recurring problem of invisible windows. When a bird flies into a window, it’s a tragedy. The only thing we can do is put a sticker on it – or just don’t be so dedicated to keeping them clean, Fergal!